In yet another photo op on the White House South Lawn, President Obama blamed Bush “intelligence estimates” for his lack of timely response to the deaths and devastation which he has allowed his brethren ISIS. Could this be a reason the current intelligence is inadequate? You’ll never hear it from him or Valerie Jarrett or Susan Rice or anybody he has placed in his inner circle of America hating subversives. However, even the blind Democrats (except for Harry Reid and Nancy Pelosi) are beginning to rumble about who the jayvee team really is. Refused to wear a lapel pin replica of the American flag because it would represent a “false” patriotism? 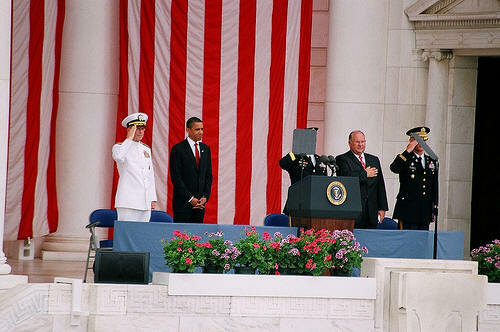 Would not salute the flag or cover his heart for the national anthem? Avoided Memorial Day services at Arlington? Avoided Easter and Christmas services at the White House? Mysteriously wore no jewelry (watch or wedding ring) during Ramadan? Bowed in reverence to foreign dignitaries? Apologized for an arrogant America when overseas? Stole money from normal, working citizens to pay union bosses, multi-millionaires and multi-billionaires running failed financial institutions? Allowed raises for Congress and government workers in a recession? Withheld more money from seniors’ Social Security for declining Medicare services? Ran the country into the poor house spending more money than is available, professing its use to enhance the economy while driving that economy into the ground? Forced companies to send their manufacturing and production to foreign countries by taxing and regulating our businesses out of competitiveness. Held regular Wednesday night concerts for V.I.P.s and his family at the White House when many Americans cannot afford to go to the movies? And now he is charging the American taxpayers, not his own campaign fund or the DNC, for a campaign bus tour to lie about his accomplishments and intentions, hoping the ignorant masses will re-elect him to continue the destruction of the country and guaranty their own enslavement. Obama is off for India. For what purpose, the American people may never really know. What we do know is that though Hindu is the most popular religion in India, it also is home to the world’s third largest Muslim population. From India he is headed to Indonesia to visit the Istiqlal Mosque. The Istiqlal Mosque is the world’s largest and most powerful Mosque. Indonesia also boasts the world’s largest per capita Muslim population. They can, and do, command and control homicide bombers and terrorist activities throughout the Pacific and much of Asia from that region. Obama will undoubtedly be apologizing to the most powerful Muslims of the world for America’s insolence. He will unquestionably ask for forgiveness and promise an America that will be more submissive and accepting of future Sharia dominance. You are currently browsing the archives for the Islam/Muslim category.